Scott Simon: Enya has been called ethereal, haunting, multi-layered and mystical and just a wee bit funky as the Irish probably never say. The recordings of the sound of a chorus of angels, though it's actually just Enya herself singing and playing keyboard, strings, and percussion. She and her producer, Nicky Ryan, layer one track of her voice over another and so on and so on to produce the musical equivalent of mixing watercolors for a skyscape. The Grammy award winning Enya now has a new CD called "Paint the Sky with Stars: The Best of Enya" and she joins us from our studios in New York City. Thank you for being with us. Scott: When you think of music, do you think of your own voice sounding twelve times behind you? [Enya laughs] How does something come into your mind at this point? Enya: Well, basically I would work in the studio writing a melody and when that moment happens I usually like to let the music take me on a journey itself so when I sit back and listen to the finished melody, it's only then that I can hear what it's about. Enya: It is, very much so because I find I am not one of these composers that are, you know, walking along a beach or walking on the mountainside in county Donegal that, you know, "oh! a melody!". It's more a matter of eventually taking that moment with me to the studio and it begins to evolve. Scott: Ms. Enya, could you describe the way you put an album together for us? It sounds like a process that's so detailed and exhaustive, nobody else seems to undertake it. Scott: Is Orinoco Flow probably the best known song you have on this CD? Enya: Well, definitely the most important song, I feel. Because it introduced me to a lot of people. But favorite-wise? I have a few favorites that I kind of pushed on the "best of" who would be one of the first ones...Watermark, the instrumental. I just love the melody so much and the other song that's a favorite of mine, which I didn't write, is Marble Halls which was written by an Irish composer called Balfe [Orinoco Flow fades into Marble Halls] and it was in an opera called "The Bohemian Girl" and I came across it when I was working Shepherd Moons and just immediately was drawn to it and when I finished recording it, I was speaking to my mum and I mentioned to her did she know the song...it's a very classic song...and she said "oh yeah! ", you know, "we did the opera at school and I sung Marble Halls!" and it's been incredible, the reaction with so many people who have come to me, telling me my grandmother sung me that song, my mother knew that song and, you know, so it's a very, very favorite song of mine. Scott: I take the license to ask this as the son of an Irish mother [Enya laughs]: Is there something about the language of gaelic and something about the way Irish people can speak the English language that encourages a musical sense? Enya: [pauses] Well, you know, for me singing in gaelic it's very, very natural to do because it would be my first language and I think lends itself very much so to being sung. You know it wasn't so long ago that, you know, it was not popular to speak gaelic in Ireland itself because of the areas that gaelic is spoken in were much poorer areas and it ws a case of the last, say, twenty years all of a sudden, you know, Irish music has become more popular and Ireland itself is a place now that people come to visit because up to then it was like you would travel from America to England and to Europe. Scott: Could you tell us about some of the new songs you have on this CD? Enya: [reciting] "Come to the edge, he said. They said, We're afraid. Come to the edge, he said. They came, he pushed them, they flew" and it was like I loved it. I love this kind of feeling of, you know, so many people who are so afraid to take that step and there is always a risk factor involved, but it's so rewarding when you take the step and so the song "Only If..." is really about that. Scott: In a sense because we just listen. That has to be our first reaction. Enya: I know that for some of my fans that when they talk about listening to the music...firstly they enjoy the music [Watermark begins to play], they'll talk about their favorite song, but so many of them seem to be able to interpret their own emotions with the music. Enya: You know I think it's really important to have time to yourself and a lot of people don't take this time anymore. You know it's...you're caught up with work and, you know, and very noisy environments that we live in today and so therefore you don't get the opportunity to sort of just sit and ponder and think about life in general...but I feel that people are doing this through my music and I think that's really healthy. Scott: And said to you, "C'mon! Sing 'You Ain't Nothing but a Houndog'! "...could you do it...would you want to do it? Enya: Ummm...no because, you know, I...there's a side of me that's, you know, quite shy, you know, and what I feel with my music is that I can express myself so much and a lot of the fans can sense that I'm relating to them something, you know, that's quite personal, so therefore standing in the [laughing] streets singing wouldn't be something that I would be known for. Scott: Oh, alright...well I guess I meant... [pauses] do you ever enjoy just standing around singing, maybe with your friends and not just singing with yourself over and over again in the studio? Enya: Oh, oh yeah, oh yeah, yeah...when I was growing up, you know, I'd be in the choir. My mum was the organist in the church, so I'd, you know, sing and in the church and I'll be doing that on Christmas Eve, actually. I'll join everyone in Gweedore and we'll sing some Christmas hymns. Enya: Oh thank you...it was lovely talking to you! 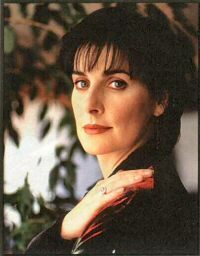 Scott: Enya...her latest album is called "Paint the Sky with Stars: The Best of Enya". [Boadicea plays] It's released by Reprise Records and she joined us from our studios in New York City. Note: Transcribed by Book of Days/TreeCat. Nicky Ryan wrote a note about the accident to Sail Away International fan club, which was posted to the alt.music.newage usenet group. The message can be viewed via this link: Nicky's Message to Sail Away International..